On Monday night, I headed down US 101 to attend a lecture at the Computer History Museum in Mountain View on industrial design at Apple over the years. My original plan was to post this write-up Tuesday morning, but that quickly got scuttled by MacBook Pro Update Madness. So let’s take another stab at this, with the hope that Apple won’t release another round of product updates by the time it takes me to type out a few paragraphs. The featured speakers for this industrial design lecture were Jerry Manock and Robert Brunner. Manock’s name should be familiar to anyone well-versed in their early Apple folklore —he was employee No. 246 at Apple, involved in the design of the Apple II, Apple III, and original Macintosh. Brunner’s time at Apple came during a comparatively less publicized era—he was the company’s Director of Industrial Design from 1989 to 1996. His design work during his Apple tenure included the Mac Color Classic, the Macintosh LC 520, and the original PowerBook—the very first Mac I bought with my own money, a PowerBook 145B, is sitting right here on my desk and bears some of Brunner’s handiwork. It also illustrates, from my point of view, how critical design has been to what Apple has produced over the last 30 years. Manock designed products in the ’70s and ’80s, Brunner primarily in the early ’90s, and Ive today, but, even accounting for different eras and styles, you can see some common themes emerging over the decades to how Apple’s designers go about their business. That question may have been specific to Manock’s education, but it seems to be one that gets asked a lot at Apple. Consider the list Macworld put together last year to recognize the 30 most significant products in Apple’s history. 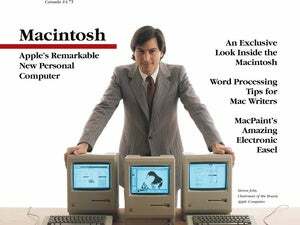 Several of the products we included—the Apple II, the PowerBook 100 series, the 20th Anniversary Mac, and, of course, the Macintosh 128k —were discussed in detail Monday night. And some of the credit for why these products made such an impact rightly belongs to the designers at Apple and the decisions that they made. It was an interesting talk, and one that a mere blog entry can’t really do justice to. Fortunately, the Past Events page on the Computer History Museum’s Web site includes a link to a Windows Media file of the lecture, so you can watch and listen for yourself, if you’re so inclined.